Central PSUs have turned in a good show on the investment front in 2009-10, in contrast with the dismal performance in the previous year that saw the worst effects of the global economic crisis. An FE study reveals that gross capital formation (GCF) at current prices, which shows the investment momentum, of 57 public sector undertakings other than banks and NBFCs, has increased to Rs 1.17 lakh crore in '09-10 from Rs 70,518 crore in '08-09. GCF is measured by the total value of the gross fixed capital (assets) formation, changes in inventories and acquisitions less disposals of valuables of a company. The share of gross fixed assets formation (GFAF) in GCF decreased from 91.7% in '08-09 to 78.9% in '09-10. On the other hand , the rate of GCF increased from 11.1% to 16.6 %. Net capital formation shows a similar trend, increasing from Rs 50,001 crore to Rs 92,846 crore. Indian Oil Corporation leads the ranking chart based on GCF, followed by MTNL and NTPC. Industry-wise, the share of refineries group in total GCF was the highest in 09-10. IOC recorded the highest ever capital expenditure during 09-10. Its major project at Panipat, the naphtha cracker plant, was commissioned as also the hydrocracker at Haldia refinery. MTNLs significant gross block additions during 09-10 include adjustments on account of value difference, and spillover cost identified in respect of existing fixed assets. The list of 57 PSUs with more than Rs 25 crore sales are considered for this study. The companies have been classified into 29 categories. The basic data compiled are based on audited annual accounts for 07-08, 08-09 and 09-10. As for components, GFAF steadily increased from about Rs 76,896 crore in 08-09 to Rs 92,733 crore in 09-10. The inventory accumulation turned out to be positive of Rs 24,721 crore during 09-10 from a negative Rs 6,378 crore during 08-09. The share of inventory accumulation in GCF turned out to be positive of 21.04% from a negative of 9.94%. In 09-10, net fixed assets formation (NFAF) constituted 73.4% (112.7%) of the NCF. In the case of components, the GFAF rate increased from 14.73% to 15%. The inventory accumulation rate turned out to be positive of 27.9% in 09-10 from a negative of 6.7% in 08-09. The study also shows that in the year 09-10, when the GFAF rate (15%) was slightly lower than the corresponding GCF rate (16.62%), the rate of inventory accumulation rate (27.95%) was significantly higher than the corresponding rate of GFAF. The rate of NCF increased from 11.96% in 08-09 to 19.83% in 09-10. The NCF rate of 19.83 % was higher than the corresponding rate of GCF and the highest rate of 11.96% in 08-09 was higher than the corresponding rate of GCF. The NFAF rate increased from 17.40% to 17.90% in 09-10. 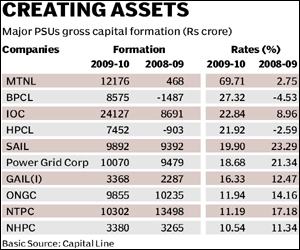 These 57 PSUs are ranked according to GCF during 09-10. Among the top 5, IOC (Rs 24,127 crore) came first followed by MTNL (Rs 12,176 crore), NTPC (Rs 10,302 crore), Power Grid Corporation (Rs 10,070 crore) and SAIL (Rs 9,892 crore).Among these highest GCF rate was registered in the case of MTNL (69.7%) followed by IOC (22.8%). In the industry-wise analysis, electric equipment, gas distribution, oil exploration, power generation, refineries, steel and telecommunications recorded GCF exceeding Rs 1,000 crore in 09-10. Except the telecommunication industry all the above industries have more than Rs 1,000 crore GCF in 08-09. Diversified, gas distribution, oil exploration, paper, refineries, steel and telecommunication companies registered uptrends during the study period. Out of the total GCF of Rs 1.17 lakh crore in 09-10, refineries group constituted Rs 46,406 crore followed by power generation (Rs 26,088 crore). Among the industries studied, telecommunications (55.5%), trading (28.7%) and refineries (23.9%) recorded higher rates in 09-10. The GCF rate increase for others were: diversified (1.79% to 6.47%), gas distribution( 15.95% to 18.03%), oil exploration (10.11% to 11.62%), refineries (1.90% to 23.9%) and telecommunications (2.48% to 55.5%). The highest and lowest GCF rates were registered in the case of telecommunications and fertilisers, respectively. The highest inventory accumulation was recorded during 09-10 by refineries (Rs 23,949 crore), followed by trading (Rs 1,556 crore). The inventory accumulation rate has increased for diversified, power generation, refineries and trading companies.